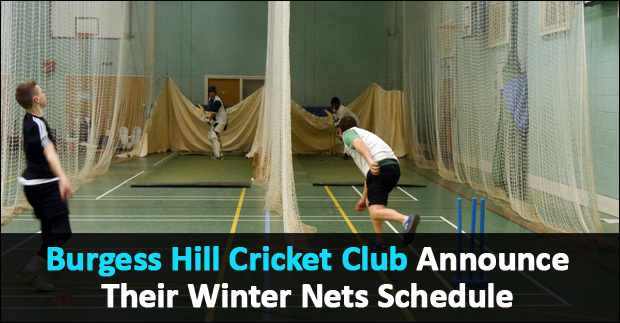 Burgess Hill Cricket Club have announced their winter nets schedule as the club prepare for the 2019 cricketing season beginning this April. The sessions will once again be held in the Hurst College Sports Hall every Sunday afternoon for the Youth (2pm-5pm) and Sunday evenings for Adults (7.00 pm – 9.00 pm ) Sessions commence on Sunday 3rd February and willl continue up until Sunday 31st March. Adult nets commence on Sunday evenings between 7.00 pm and 9.00 pm at Hurst College from the 3rd February, continuing up until the 31st March. We have again booked four lanes this year. We anticipate that these will be allocated as lanes 1,2 & 3 for Adult and Youth players and lane 4 for our Ladies as before. For the Sunday afternoon sessions we are proposing the following times and lane net allocations for the boys and girls, based on their age groups for this coming season. These, we believe, use the optimum allocation of time and coaching resources whilst balancing out the numbers of youngsters in each age group. The timetable for youth sessions by age group is below. Any U10 boys who are considered by their manager and their parents to be competent and safe to play hard ball cricket will be able to attend the U11 sessions from 2.00 – 3.00 pm. Those older girls who already play Ladies cricket can attend the evening Ladies net sessions instead of, or as well as, the afternoon ones. Those U15 boys who have played adult cricket can also attend both the junior and senior sessions. Do you fancy getting back into cricket and giving the winter net sessions with Burgess Hill Cricket Club a go?